This TV commercial was conceived by Create Infinity Video Productions. The soundtrack was supplied by the client. Video background was created by Create Infiinity Video Productions. Character choreography, cameras, lighting, modeling and animation was done by Flying Samurai Productions. The “rentorilla” ape was originally designed to bring to life a stylised 2D logo. 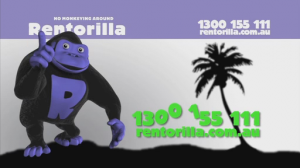 The company subsequently changed all of their corporate badging to match the 3D character designed for this TV commercial.